Once again I start the report with the annoying news that the May water has not completely gone. Most areas are clear of it including the Eastern end of Chesil Beach, from Langton Herring to Portland. Unfortunately Abbotsbury, West Bexington, Cogden and the areas further West still have it. Although I did see a few Mackerel caught whilst I was at West Bexington yesterday, I would have expected a lot more at this time of year. Portland is fishing well as David Nute proves. 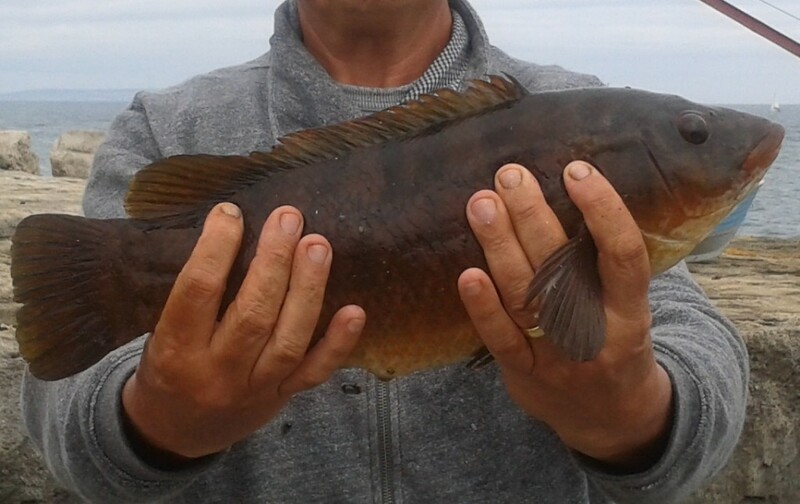 He sent me an email with a picture of a 4lb Wrasse that he managed to catch at Portland Bill. The fish fell to Ragworm on light tackle. A Wrasse that size is going to give you a great fight on a light sporting rod. Chesil Beach:Calm with asmall swell and clear water East of Abbotsbury, but coloured to the west of Abbottsbury. Chesil Beach forecast: The fishing don at Ferrybridge an towards Portland should be good. Expect Bream, Gurnard, Mackerel, Smoothound and Bass from that area. Add some Pollock and Wrasse as you get further into Chesil Cove. Further to the West at West Bexington and Cogden Plaice, Smoothoud, Bass and Rays should be on the cards. Mackerel will be possible but I would fish the other end of the beach if you want a better chance to get them.